The “second point” in the Synod of Dordt’s response to the Remonstrance written by the followers of Arminius was that of “Unconditional Election.” Remember, the “five points” are simply a direct response to the five main points in the Remonstrance, or Arminian positions. it isn’t fair to the Scriptures or their Author to boil down the God-story to five points and each point should be taken into consideration within the whole context of the Scriptures. Because Adam transgressed, God made it clear that he and all his decedents are guilty. The sentence for that guilt is eternal death. God was under no obligation to save Adam or a single decedent of Adam. His justice would have been completely satisfied by saving no one or obliterating His creation at the moment of Adam’s transgression and started over. Election doesn’t actually save anyone. The Father elects, the Son gives Himself as redemption to save, and the Spirit renews the heart and instills that saving faith in the Elect. There are countless others. This was the doctrine that I stumbled upon. The other doctrines of salvation I knew I was wrong about as a young believer (I didn’t always believe this way! I was an Arminian believer for years!) were easy to overcome. This one was hard. He isn’t “fair?” He “chooses” hell for some? As the image of my daughter dying in my arms was still very fresh and as I considered the ridiculous books that some well-meaning people handed me full of unBiblical junk about salvation and how it happens, it hit me: If He created the universe, set the standard, and works out His will and personality through His creation; perhaps I should re-read the Scriptures without the lens of human preference and see what He is really saying. The whole counsel of the Scriptures is about the Author, the Potter, and the Lord writing His story, molding His clay, and ruling over His creation. Who am I to question His plan or his will? Who am I to read into the Scriptures some effort, work, or decision I must make to be saved? It sits well with my current base nature…but not with His eternal truth. 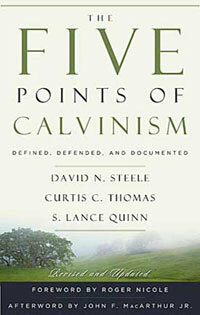 I am going to try to go through the entire five points of Arminianism and Calvinism over the coming weeks. The Arminian points came first as a response by the followers of Jacob Arminius after his death to the current teaching of all known Protestant faiths at the time. Their “Remonstrance of 1610” challenged Church teaching about salvation and free will up to that time and the Synod of Dordt was called to address the issue. Church leaders from all over Europe were called together to consider the five points of Arminian followers in the Remonstrance. The teachings of the Church in the known world at the time had their roots in the Scriptures as well as in the fight against Pelagianism and other heresies by early Church fathers including Augustine and others. Five points came out of the Synod in response to the five that were outlined in the Remonstrance. The Synod made it very clear that the doctrines of salvation should not and could not be defined by five points but they felt that the Remonstrance needed a point-by-point rebuttal. The term “Calvinism” was adopted over time, not because John Calvin was anything extraordinary, but because he taught extensively on the subject throughout his ministry. The first of these five points in the Arminian Remonstrance of 1610 defined “Free Will.” An overly elementary summary of the first point by Arminians is that humans, although seriously affected by the Fall, have not been left spiritually helpless but are left a remnant of spiritual light capable of understanding the Gospel and choosing to embrace it of one’s own Free Will. The Synod of Dordt reaffirmed the belief that we are totally depraved. One hang-up some have with “total”depravity is that they don’t believe that people are incapable of doing any good. I don’t disagree. Evil and lost people do ‘good’ things. But the “total” in Total Depravity is more of a holistic totality. The totality of the individual is lost and incapable of choosing salvation. We are not, under the Curse, given the power to reach out to God in any way that affects our eternal disposition without Him choosing us first. I also believe that man was not created depraved initially but it is solely a consequence of sin through Adam. And who are we to arrogantly tell God that the punishment for sin (depravity) is too great? Note the myriad Scriptures that make it clear that God Himself gives faith, grants repentance, and creates new hearts. Spiritual life, theology, and doctrine reside on a spectrum. On one end is the lie that Satan himself wants us to believe (that we are unworthy or that His Word doesn’t mean what It says) and on the other end of the spectrum is human pride that leads to works-related doctrine. I believe that I’m probably an evangelical by definition but I hope I never act like one. I believe that the Church is the Elect and is not an institution or location. I believe in an inerrant Scripture (we can argue about translations and church tradition) that is capable of speaking for itself, interpreting itself, and speaking to every issue. I believe there is no timeline in the Scriptures for spiritual gifts. I believe that all the gifts are for today. I believe, however, human nature tends to swing too charismatic or too stoic (the “frozen chosen”) and the burden is on us to find the appropriate balance. I believe that if the Church stopped building multi-million dollar buildings, paying mega-church pastors mega-sized salaries, combatted relativism, and invested our money in meeting the practical needs of others instead of bolstering what we call our “ministries;” we’d win over the hearts of the unchurched. Because our time and resources would be vested in our communities; we’d become so passionate about them that our love for our neighbors would win far more souls than any church service, outreach program, multi-media presentation, or under-sized missions budget ever could. I believe the assembling of ourselves together as believers is primarily for the encouraging and equipping of each other – not for “gettin’ people saved.” In many cases, bringing new believers to church is a sure-fire way to ruin their potential as ambassadors for Christ. I believe the Church is capable and responsible for the welfare of its community – not government. Government should supplement the Church’s benevolence, not supplant its role as caregiver to the broken, poor, and needy. Our ability to turn into pansies when the IRS threatens us for proclaiming truth, discussing issues, or teaching on the intersection of faith and public policy is one of our greatest areas of shame. I believe that, since the Scriptures teach us to obey the laws of man, that a Republic like ours in America that is dependent on our engagement to function well turns out civic engagement into a spiritual necessity. I believe one God-fearing man or woman can change the world, change culture, change public policy, or even a church. You never know if it’s you until you live your whole life pursuing the opportunity and never grow weary in the work. I believe most doctrinal differences, although important, are far less important than choosing to work together to practice pure and undefiled religion (James 1). I believe I spent too much time in Western Christendom and therefore stink at living a missional and relevant spiritual life. I am, however, working on it. You are currently viewing the archives for March, 2012 at Eric Goranson.